After her husband, Joe (Jonathan Pryce), wins the Nobel Prize in Literature, Joan Castleman (Glenn Close) begins to question the choices that she has made in her life and the compromises that she has made during her marriage. The first scenes in The Wife tell us all that we need to know. As Joe Castleman slips into bed munching something sweet in nervous anticipation of an important and life changing telephone call, his wife slips into her traditional role. She warns her husband that he will find it hard to sleep if he eats sugar before bed. Later, she reminds him to take his medication, remembers where he last put his glasses and wipes the crumbs from his now greying beard. More parent than partner, Joan Castleman appears happiest out of the limelight. She is reserved and supportive, quiet and unassuming. All too often, Joan gets brushed aside in favour of her more needy and attention seeking husband. The face-value dynamic between Joan and Joe - between celebrated spouse and long suffering "muse" - is interesting enough. However, as hinted in the opening minutes of Björn Runge’s film, there is much more at play. While Joan has made many concessions in her life and accepted her husband’s limitations (and many infidelities) she is no victim. Behind the scenes she is, as she tells her husband's would be biographer (played by Christian Slater), far more interesting. She is a king maker. However, her marriage is full of devastating secrets and, as the couple travel to Stockholm for the Nobel Prize ceremony, the price she has paid for her life choices becomes all too painfully clear. Glenn Close, who has been attached to this film for many years, gives a stunning performance as Joan Castleman. Her portrayal is quiet and complex, beautifully nuanced and full of emotion. When she is on screen, you cannot help but study her face - irresistibly drawn to her (usually wordless) reactions. Runge is, of course, perfectly aware of Close's power. The director keeps her in his frame as much as possible (and often in close up). In one scene, we only see half of Joe's face as he gives a speech - the camera maintains its focus on Joan. At times more powerful and satisfying than the film itself, Close’s portrayal deserves all the accolades (and Oscar buzz). However, she is also supported by strong performances from the rest of The Wife’s cast. Jonathan Pryce is pitch perfect and utterly convincing as Joe Castleman. He conveys Joe’s many flaws - his insufferable neediness, the callous way he belittles his son (who is also a writer), his disregard for Joan’s wishes and his pathetic flirtations - while also allowing us to see why Joan loves and has stayed with him for so many years. The start of their marriage is conveyed via effective flashbacks. Annie Starke (Close’s real life daughter) plays the young Joan, while Harry Lloyd is Joe. These scenes help us to understand the foundation upon which the Castleman relationship is built. As Joan feels the ground shift beneath her, so Close’s restrained portrayal becomes more and more impressive. We feel everything that she feels and it is Close’s performance that lingers long after the film's conclusion. The Wife is adapted, by Jane Anderson, from the best-selling book (of the same name) by Meg Wolitzer. 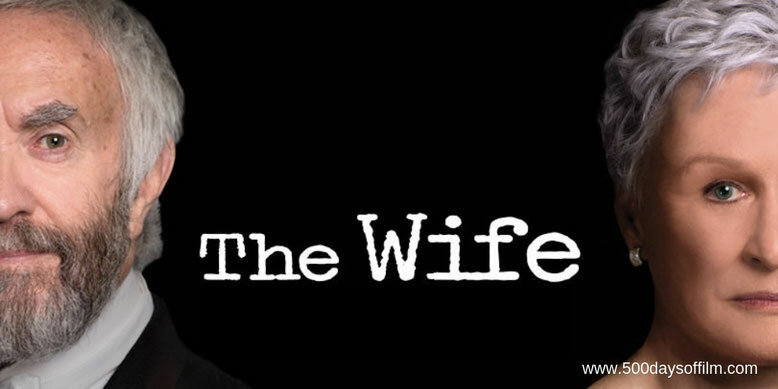 Have you seen The Wife? If you have, what did you think of this film? Let me know by leaving me a comment in the box below. Alternatively, get in touch via Twitter. You can find me @500DaysOfFilm.